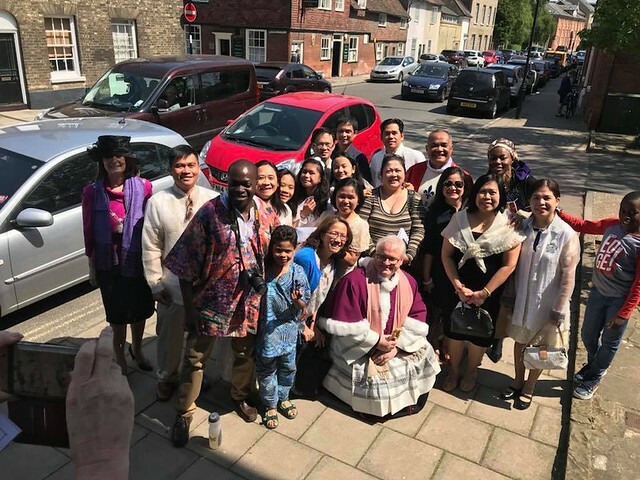 St Edmunds church in Bury St Edmunds marked Pentecost with an international weekend celebration. Fr Alvan Ibeh reports. This year Pentecost was celebrated in grand style involving a whole weekend of international events with the theme "We are one big family of God". The celebrations began on Friday May 18 with an evening of prayer and praise in preparation for Pentecost. This involved Exposition of the Blessed Sacrament, prayer of Consecration to the Holy Spirit , prayer for the gifts of the Holy Spirit, prayer for healing, prayer for parents and young ones, etc. These intentions were accompanied by songs of praises and worship. The evening had over 30 people in attendance. Saturday 19 saw an international evening with over 50 people including representatives from all the different communities in our Parish. Each community talked about some aspects of their culture which was entertaining and enlightening. They also taught the audience how to prepare a particular meal local to them. The communities that made the presentation were ' the English, German, Polish, Indians and Filipinos. We were also delighted to have Fr Totet, who is the Parish Priest of our twin Parish in Cambodia, who talked about life in Cambodia. This activity is very important because it is only when we understand each other in our diversities that we will be able to be united as one big family. Pentecost Sunday was the grand finale of the whole celebration, with an international Mass to mark the feast. The Mass began with a procession from the car park with all the different nationalities holding up their flags. The Mass was beautifully celebrated with Fr Alvan Ibeh as the Chief Celebrant, flanked by Fr Totet and Deacon Alan, with Canon Mark Hackeson also present at the altar. Also present at this lovely celebration was the new Mayor of St Edmundsbury , Cllr Margaret Marks, with her consul and Mohammed, who is the spokesman of the Muslim community in Bury St Edmunds. The whole church was beautifully adorned with the lovely outfits people wore to Mass. The Parish international choir sang at the Mass. This was their first outing as a new group made up of the main choir and members of the different communities in the parish. The music for the different parts of the Mass was done in different languages ranging from Igbo (Nigeria), Polish, Tagalog (Philippines), French, Malayalam (Indian). The bidding prayer was said in the different languages – English, Polish, German, American, Lithuania, Spanish, Italian, Malayalam, French, etc. The second reading was done in French. The homily was given by Fr Totet who stressed the importance of the Holy Spirit in our lives and mission as Christians. Our mission is to spread the good news of the gospel and in order to do this, we need courage and boldness which the Holy Spirit gives as it happened on the day of Pentecost. The Mass was indeed a very joyful and colour one thanks to the united efforts of the Parishioners. Immediately after the Mass, celebrations continued in the Crypt as we all went down to have a taste of different dishes from the different communities in our Parish. The crypt was packed with over 200 people, adults and young people. There were foods from India, Malaysia, the Phillipines, Ghana and England and variety of lovely cakes and deserts from Poland and Lithuania. The bar was also open for drinks. It was indeed a great celebration thanks to God and to all who contributed in one way or the other. Pictured above is the Pentecost international weekend celebration at St Edmunds in Bury St Edmunds. Click here to see a full picture gallery or see below.